In the fifteen years since Wayne Campbell (Mike Myers) and Garth Algar (Dana Carvey) broadcast Wayne’s World via their local Aurora, Illinois public access television network in director Penelope Spheeris’ winning feature-length Paramount Pictures spin-off of the SNL skit-- technology has made it possible for even kids half their age to reach a far broader audience and via Internet and popularity of web-casts. And while most junior high or middle school students spend their time discussing who or what to add to their MySpace Page—in Nickelodeon’s sophisticated tween series iCarly which is fittingly history’s first show to incorporate wholly original “kid generated content” into a series—when the likable, ambitious tech-savvy entrepreneurs Carly (Miranda Cosgrove), Sam (Jeanette Mc Curdy) and Freddie (Nathan Kress) have finished with their studies, they devote their energies to creating a wildly successful web-series. 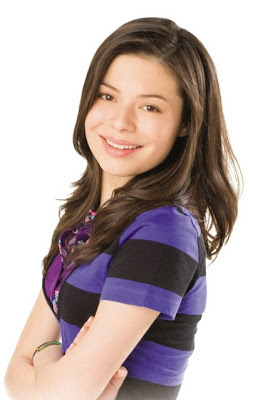 Named after Cosgrove’s charming character, the show within the show-- iCarly-- began as an accident after footage of Carly and Sam goofing off at the expense of a strict teacher was leaked online. 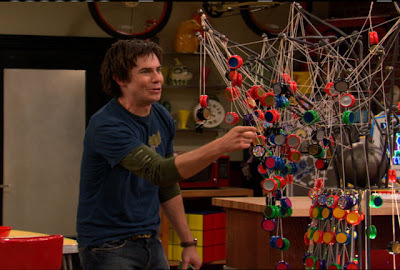 However, when the site began receiving tons of hits all with encouraging comments that fans wanted more hilarity from the gifted, junior improv artists—soon brainy Carly and her mischievous, rebellious friend Sam turned to the IT prodigy Freddie to serve as the show’s technical producer and extraordinaire. Broadcasting from the top floor of their Seattle apartment building which the kids and Carly's legal guardian-- her law school dropout turned twenty-six year old oddball sculptor Spencer (Jerry Trainor)-- have turned into their very own TV studio for their weekly series that grows into a net phenomenon. Incidentally released onto DVD from Paramount—who over a decade ago entertained my generation with Wayne’s World-- the hip, trendy, appealingly upbeat girl-power centric iCarly continues on where the opening half of the season left off with this slim-packaged second volume of the twelve concluding episodes that comprised the first season. Reminiscent initially of a timelier cross between Punky Brewster and Saved By the Bell-- admirably, iCarly is smart enough to take main plot-line of its show seriously to show the advantages and annoyances of life on the web as Carly meets a creepy, well-meaning but over-eager fan and adults try to manipulate the show by corrupting it with cash buyouts in the form of product placements, a short-lived television deal, and more. While admittedly the contents of the iCarly web-cast series play much better to a younger crowd as sometimes the girls come off as two over-excited children who ate all of the Halloween candy they managed to bring home in a single sitting when Freddie’s camera is on them—the plots of the overall show and believable chemistry between the stars helps heighten it considerably. Ultimately, we realize that-- especially in some standout episodes like “iHeart Art” which finds Carly having to counteract negative artistic feedback given to her brother to re-inspire him and “iStakeout,” when their apartment becomes the location of a police stakeout after possible incriminating footage was captured in the background of one of the web-casts-- it’s much more than just a series about a goofy, juvenile web-show. No and far more appropriately, it's one that celebrates the ingenuity, loyalty, and makeshift modern family that three decidedly different kids form during the technological age. In fact, in a surprising twist, Carly—whose mother is never mentioned but father is overseas stationed in the military-- resides with her brother Spencer. And while the two are incredibly close, you get the sense that he’s equally reliant on her for care as well and this idea is repeated again and again in the set-up of the headstrong Sam’s absentee, daffy mother and Freddie’s over-protective one as the kids seem to be much older than their roughly thirteen years of age. Overall, it's one more mind-bogglingly superlative program offered by Nickelodeon that proves that the channel not only understands its audience from its youngest toddler aged viewers to its teenagers but also respects them enough to create challenging and intellectually stimulating programming that accurately reflects their lifestyle. 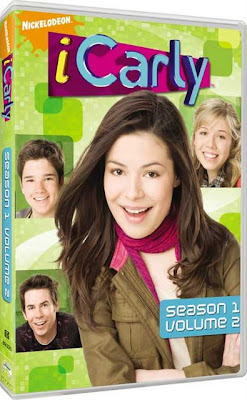 Likewise, this highly recommended DVD of iCarly which should also be purchased with the first disc to fully catch up on the entire season (which I absorbed fairly quickly via Netflix’s Roku Instant Viewing Option), also contains some fun behind-the-scenes extras, including footage of the cast getting slimed--Nickelodeon's version of the Hollywood Walk of Fame-- as well as a bonus pilot episode of another brainy female oriented show, True Jackson, VP.